First, let’s understand what a “nail pop” is – simply a nail head that protrudes above the surrounding surface. They’re usually caused by structural settling or by normal expansion and contraction – both interior and exterior. Here’s how to deal with them. On exteriors, a nail head that is visible does not mean that nail head has “popped”. On exterior work it’s generally impractical to make nail heads invisible. They should, however, not be protruding. On newer construction especially (less than 25 years old, very often “value engineered” plywood siding) structures settle, construction is hurried and sometimes improperly dried lumber is used – a perfect recipe. If the siding contractor had only adjusted the nail guns to just dimple the siding surface… Or if another second was taken to be sure that each nail was driven perpendicular to the surface… Or if a better quality siding material had been used… But no time or money for all that. Nail heads that are visible but that have not loosened to break the paint film are doing their job just fine and it’s best to let them be. Nails that are protruding should be set flush with a hammer, primed if there is evidence of rust and sealed with a high grade caulk to keep moisture out. We recently had a suburban homeowner insist on “fixing” visible nail heads. While the were less than a handful on the whole house that had actually “popped”, this homeowner wanted her painting contractor to drive all visible nails flush with the siding and then caulk to seal. Here’s the problem: in doing that it’s very likely that the nail or surrounding siding will be damaged (errant hammer gouges siding, nail now more likely to rust) or that the nail will be over-driven and the surface membrane will be pierced. And with that is a much greater chance of moisture infiltration, no matter how much caulk is used. 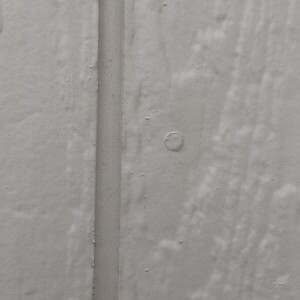 The consequence of caulking each nail head is seeing a smooth dab of caulk every 16″ on a field of faux-wood or -stucco texture. Yes, you’ll see the texture difference right through the paint – and all across the side of the house. Generally the same set of causes, interior nail pops have more straight-forward fixes. If it’s loose enough to remove by hand, do so. If not, tap it below the surface. 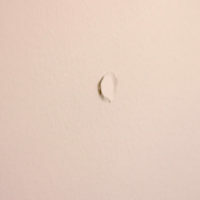 Either way, drive a screw about an inch or two from the offending nail to secure the drywall – this makes a reappearance much less likely as screws have greater holding power. Now, just skim with spackle or drywall compound, sand smooth and paint – easy! However, if you’re not sure of the status of your “pops”, please give us a call. 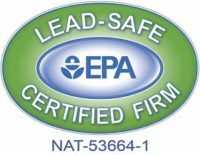 Crestwood Painting has been EPA Lead-Safe certified since 2011, many of our Job Leads have also been trained and certified, as well. Lead in paint has been outlawed since 1978. If your home was built before that the EPA says that lead-safe work practices must be followed. That means lots of tape and plastic to protect your home and family (and your contractor). If a pre-’78 home is proved to have no lead in the work surfaces then lead-safe practices do not have to be followed. But the test procedures are fraught with their own set tangled rules – so we just assume lead on every pre ’78 project and work accordingly. This means more more prep work than most contractors will do: we cover gardens to keep paint chips out, we sweep and vacuum driveways and decks and very often we’re told the yard is cleaner than it was when we started! We equip our painters with gloves and proper breathing protection when they’re scraping, too. And soap to wash hands before lunch and at the end of the day. We keep the soap in a nylon stocking – it’s an old Girl Scout trick (the nylon stocking keeps the soap free of dirt). There was a lot of eye-rolling at first but our painters do use it – while they tease. Lead poisoning is very serious business. Young children and pregnant women are especially vulnerable. Contractors that ignore the EPA’s RRP (Renovate, Repair & Paint) regulations are putting their business at risk. Those same contractors are also unlikely to share the risks with their customers or their employees. Yes, it’s true – there is a slight cost difference in complying: more time in implementing lead-safe protection, more materials also. On the flip-side, our systems allow us to protect very efficiently and clean up much more effectively than we ever did before implementing lead-safe work practices. It feels good to do the right thing. All that, and a contractor’s nod to the Girl Scouts, to boot! Properly stored paint can last many years. The leftover (latex) paint in your basement will, sooner or later, become a disposal problem. Here’s how to make sure your next can of paint remains in usable condition. As a general rule of thumb, if a can of paint is less than one third full it is not worth storing – leave the lid off and let it dry completely. Then, leave it out with your household trash – dry paint is considered disposable household trash. Important to note: liquid paint is considered hazardous waste and must be disposed of accordingly – the Jackson County Household Hazardous Waste Disposal facility is a great option. Paint should always be stored indoors so that it can not freeze. If it has ever frozen, it is now toast. A good test for frozen paint: stir it. Stir-able paint should be OK, if it feels like a brick it’s probably been frozen. Plastic wrap will keep paint out of the “gutter” at the top of the can and will keep paint from drying on the lid. It’s best to plan ahead: as soon as you open the can that will likely be leftover, wash the lid and use a pour spout to keep the gutter clean. Plastic wrap will also keep the lid from contacting the can where corrosion can start. See the photo. Now, before the lid goes on us committed Paint Geeks will exhale long and slow into the can. This will displace oxygen (dries paint) with CO2 (not so much). Now, the lid – securely. Thumb-pressing is adequate; hammering is excessive and will usually damage the seal. Finally, upside down storage means the paint in the can seals the lid, making premature drying that much less likely. Industry experts acknowledge that just about 0% of the paint stored in your basement is likely to ever see the light of day, so the whole storage thing may be a triumph of Hope over Reason. At least now you’ve got reason to hope that your paint will remain in usable condition. Still not sure if it’s usable? Give us a call – we’d be happy to take a look. 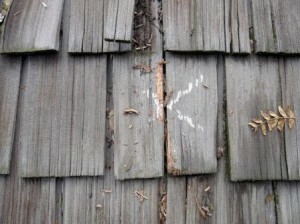 Cedar Shake shingles can split if they haven’t been cared for. Cedar shake shingles can split and curl when not properly cared for. While replacing damaged shingles sounds straightforward, here’s what to look out for. This is pretty easy – shingles are either thin (~3/8″) or thick (~5/8″). And you don’t mix them – unless you’re in a real pinch. You can get away with using thin shingles in a thick shingle installation (it will be noticeable) but you really can’t go the other way around – your neighbors will talk. There are two considerations here: texture of the entire wall and texture of individual shingles. If the shingles on the face of a house are all generally cupped (curled) you’ll want to be aware that installing a new, flat shingle may look out of place. Sometimes this solves one problem and creates another; at that point you’ll have to decide what you can live with. The other texture consideration is with the shingles themselves: older shingles have often been painted 46 times and so much of the original texture has been lost. We’ve seen grooved shingles that have been painted smooth. New cedar shingles very often have two surface treatments: one side is relatively smooth while the other is generally grooved. Easy to match grooved with grooved; a bit of a trick when new smooth doesn’t match old smooth. A new shingle may really be smooth but it may just as easily be very rough depending on where and how it was milled. Is matching texture important to you? Important enough to sand individual shingles when necessary? So by now you’ve thrown up your hands and bellowed “Oiy!” – can’t blame you. But as painting professionals it’s up to us to set the expectation with our customers – what you can expect and also what you can’t. That way there are no unmet expectations. Give us a call if you think we might be able to help. Oil paint has too many environmental downsides. While skulking about in the parts of the internet where only Paint Geeks dwell, I came upon a post titled “My Opinion of Oil-based Paint“. As this defies all known logic in the residential paint world I, of course, read it. It’s opinion, yes – and I disagree. Painters, like lawyers and other circus entertainers, often disagree – ask ten painters and you’ll get 12 opinions. What got my interest was a response to the original post from a PPG technical service rep. It was great to use an oil and/or varnish that flowed and left a glass-like finish, but we were all writing a check we will probably have to cash later concerning our health. Remember the geek in your Chemistry class? He’s now working for a billion dollar paint corporation and has devised a was to encapsulate oil molecules in water! This means that as the water in the paint dries what is left behind on your wall is oil paint. Same durability, more flexibility, better color retention, no fading, no chalking, no cracking. And soap & water clean-up. Yes, folks – this is truly Better Living Through Chemistry. 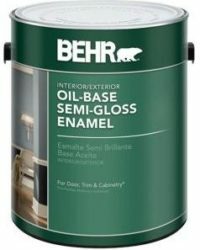 Oil base paints have a tendency to oxidize become brittle and yellow over time due to the long chain chemistry in linseed oil and mineral spirits in most resins being used. Over time, the coating loses it ability to absorb UV and other attribute like elasticity resulting in hair line cracking. I am sure we all experience the lesson of painting the inside of kitchen cabinets with an oil base coating and closing down the lights when done, only to awaken to a coating that has yellowed. Alkyds/oil base coatings need to be exposed to UV light until thoroughly cured to avoid it turning yellow along with not being exposed to ammonia-containing products. High UV exposure – they also have a tendency to fade when used with dark color containing a lower LRV (Light Reflectance Values). That is not to say that back in the day I too also love it, however never realized the amount of solvent it took to create the product creating such high levels of VOC’s and once you take away the solvents the leveling and flow cease. It was great to use an oil and/or varnish that flowed and left a glass like finish, but we were all writing a check we will probably have to cash later concerning our health. With that being said, however I agree we do need some oil base coating in order to properly prepare lots of exterior/interior type substrates with chemistry that does not agree with water-containing coatings.